Purified OsHV-1 ORF117 PCRs from earlier today were separately ligated using the Original TA Cloning Kit (Invitrogen). 50μL of X-gal (40mg/mL) was added to a LB-Amp100 plate, spread and warmed @ 37C. Three vials of OneShot TOP 10 chemically competent cells (Invitrogen) were thawed on ice. 5μL of the ligation reaction was added to the cells, gently mixed and incubated on ice for 5mins. Thecells were transferred to the LB-Amp100+X-gal plates, spread and incubated O/N at 37C. All three transformations failed. All of them produced only blue colonies and very few total colonies. The low number of colonies prompted me to look at the troubleshooting in the manual for The Original TA Cloning Kit (Invitrogen). It turns out that after six months of storage, the vector begins to lose the T overhangs. The kit I used is from 2014; three years beyond the tentative expiration date. This is likely the cause of the failed transformations. Tissue was weighed and then DNA extracted. Used the Roberts Lab Qubit 3.0 and the Qubit hsDNA Kit (high sensitivity). Used 1uL of template for all samples. Samples were stored at -20C in FSH240 in the “Pinto Transcriptome DNA” box. Created a working 1:100 dilution of ALL DNA tested here. Cycling params, plate layout, etc. can be viewed in the qPCR Report (see Results below). Firstly, the primers work and generate a single melt curve peak (see melt curve plot below); so that proves functionality. Australian samples (plasmid and DNA) amplify. French samples (M1 & M2) do not amplify. California samples: 3 of 4 samples amplify. It’s possible that the California sample that did not amplify is due to too little DNA present in the 1:100 dilution I used (or, possibly no DNA is present at all). I have not quantified the DNA in these samples – went off assumption that the samples had previously been confirmed to have DNA in them by the source laboratories. Regardless, the primers used here will amplify the French variant, but will amplify Australian and Californian variants. See labeled amplification plots below. Designed primers to target highly variable region (5′ end) of the partial Australian OsHV-1 ORF117 sequence that we have. Primers were designed using Primer3. Have ordered from IDT and will test once I get other OsHV-1 variants – to check specificity. The last run at this failed, but I think that was due to old ampicillin stocks; leading to no selective pressure for transformants that actually contained plasmid. Grew up 5mL of culture from the only two transformants in 1xLB + 100ug/mL of (fresh!) ampicillin @ 37C on a rocking platform in a 15mL conical over night (~18hrs). Isolated plasmid DNA from the entire 3mL of culture (repeated pelleting of bacteria in the same 1.5mL snap cap tube) using the QIAprep Spin Miniprep Kit, according to their protocol. Eluted DNA with 50uL of EB Buffer. Quantified on the Roberts Lab Qubit 3.0 using the dsDNA BR Kit (broad range) and 10uL of sample. Performed PCR with M13 vector primers on the two colonies that grew from yesterday’s transformation. 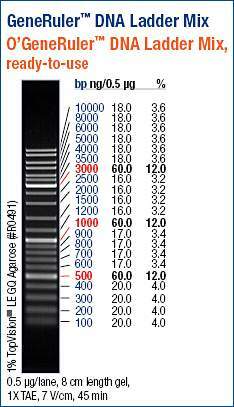 Added 20uL to each PCR tube (0.2mL PCR strip tubes). Bacteria was collected from each colony with a sterile 10uL pipet tip, which was used to streak on a separate LB Amp100 plate and then introduce bacteria to the appropriate PCR tube. Well, this might seem promising, due to the intensity of that band (~1000bp). A band of that size was also produced the last time, ableit with much less intensity. The very bright, 1000bp band generated from Colonies 1 (left) and 2 (right) is not the expected size. Based on this paper (Detection of undescribed ostreid herpesvirus 1 (OsHV-1) specimens from Pacific oyster, Crassostrea gigas. Martenot et al. 2015), the insert size should be ~1300bp (Tim Green indicated he used the primers listed in the paper to clone ORF117). However, there is a less bright band just above 1500bp. Oddly, this would be the expected size for this PCR (1300bp insert + 200bp of vector sequence from the M13 primers). The lower intensity is discouraging, though, because this indicates that M13 primers are preferentially binding whatever is producing that 1000bp band. Regardless, I’ve already inoculated two liquid cultures to grow up over night. I’ll perform a plasmid isolation on them tomorrow morning. Hopefully they actually yield some plasmid DNA to do some work with, unlike last time. Yesterday’s transformation with freshly prepared ampicillin didn’t produce any transformants, suggesting the DNA concentration is too low. Today, I eluted with 25uL. Since this volume was too little to produce excess liquid, I created a spin “filter” to extract the absorbed liquid. Briefly, I punctured the top and bottom of a 0.5mL snap cap tube with an 18 gauge needle, inserted the Whatman paper disc into this tube, and then put this tube in a 2mL snap cap tube. This assembly was spun @ 18,000g RT for 3 mins. Used 5uL of the pCR2.1/OsHV-1_ORF117 plasmid provided by Tim Green to transform a single aliquot of One Shot Top10 Chemically Competent Cells (Invitrogen), according to the “Rapid Transformation” protocol (thaw cells on ice, add DNA, incubate 5mins, plate on pre-warmed ampicillin plates). Cells were plated on pre-warmed (37C) LB Amp100 plates. Plates were incubated overnight at 37C. Wow, only two colonies! Well, as they say, you only need one. Will PCR, re-streak, and inoculate 5mL liquid cultures to see if either of these colonies seem to have the insert. This is a repeat since the previous attempt at obtaining sufficient quantities of plasmid for sequencing failed. Although I’m not sure why, I figure it’s easy enough to re-do using ampicillin stocks that aren’t many years old. The old ampicillin may not have been strong enough to put enough selective pressure on transformants, which possibly led to such little plasmid recovery. I prepared fresh ampicillin solution (20mg/mL) and made new LB plates (ampicillin concentration 100ug/mL). No transformants. So, this suggests that the original ampicillin was bad. Now, the lack of transformants suggests the plasmid concentration is too low. Will try eluting the DNA from the second spot of Whatman paper.